Warwick Avenue tube station is a London Underground station near Little Venice in inner north-west London. The station is on the Bakerloo line, between Paddington and Maida Vale stations, and is in Travelcard Zone 2. Warwick Avenue opened on 31 January 1915 on the Bakerloo line's extension from Paddington to Queen's Park. The station is located at the junction of Warwick Avenue, Warrington Crescent and Clifton Gardens. For a time prior to its opening, the proposed name for the station was Warrington Crescent. There are no surface buildings and the station is accessed by two sets of steps to a sub-surface ticket hall. It was one of the first London Underground stations built specifically to use escalators rather than lifts. A plain, utilitarian brick ventilation shaft has been built on the traffic island in the middle of the road to improve underground ventilation of the tunnels. Here's the our members favorite photos of "Metro Stations near City of Westminster". 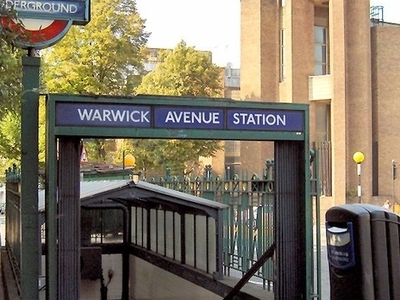 Upload your photo of Warwick Avenue Tube Station!